Jerry was raised on a small farm in the woody Ozark hills of Missouri. After serving in the US Navy and Air Force, he went into the restaurant business. He eventually made his way to the South Pacific where he worked as a hotel chef in Ponape and then Saipan. While there, he built a house, and when he needed spindles for a staircase, he found that he'd have to make his own. 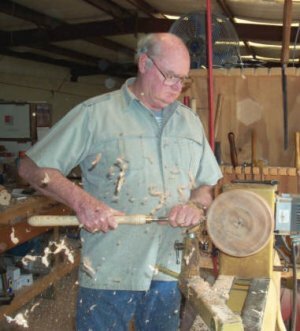 "Without any previous experience using a lathe, I turned spindles," he said. "I haven't stopped turning wood since." "Burls from any tree are my favorite to turn. Mother Nature has made the color of the wood as close to perfect as possible, so my pieces are never stained or colored." Jerry also adds, "Some of the wood I use is recycled from a local logging company — from firewood to art." Using accents of crushed stones, including turquoise, malachite, and lapis, Jerry highlights grains and imperfections in the wood he turns. "When I put my name on the bottom, I'm saying 'this is my best attempt to show off the beauty in this piece of wood, and if you enjoy the piece as much as I've enjoyed its making, then my efforts have been a success'." Jerry recently retired; these are his final pieces.